When you create a tracking link with Improvely, we give you a “Short Link” that redirects through our link shortener, or a “Direct Link” to your landing page with campaign information added to the URL tags, that you can use with your ad. Previously, only the “Short Link” could be monitored for click fraud. This sometimes meant you couldn’t monitor an ad if the publisher didn’t allow links with redirects, or your ad couldn’t display your own domain under it if you wanted fraud monitoring. Now, both the “Short Link” and “Direct Link” can be monitored for click fraud. Thanks to advances in our fraud and bot detection, we can provide fraud monitoring for all clicks, even those that don’t get redirected through our servers. If someone has already landed on your site through a Direct Link and we need to trigger your configured Fraud Alert Message, it will be shown as an overlay that pops up over top of the page content on your site. While you can turn click fraud monitoring on and off for your entire project through your project’s settings page, you can also now turn it on and off for individual links. 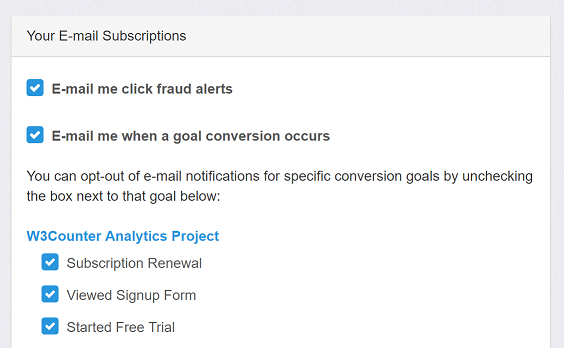 That lets you exclude links you don’t want monitored from generating click fraud alerts and warning messages. Sometimes you want to create a tracking link for a non-paid campaign like an email newsletter or social media post and don’t care about click quality, and in those cases, you can now disable fraud monitoring for that specific link while keeping it enabled for your other paid links. You’ll see a new “Monitor clicks on this link for click fraud” checkbox when creating or editing a tracking link to manage this setting.